With all due respect to Omega, complications are not strictly speaking their speciality. Of course, we’ve seen perpetual calendars made in the 1990s (included in the Louis Brandt collection), some annual calendars (as seen on the Globemaster, the previous Aqua Terra collection or the De Ville Hour Vision) and of course some tourbillon watches (Omega even had the patent for the centrally-mounted tourbillon and, as a reminder, was the first watch-manufacture to create a tourbillon wristwatch, with the 1947 calibre 301). However, all of these watches remain quite anecdotal compared to the rest of the production, including dive watches and chronographs. 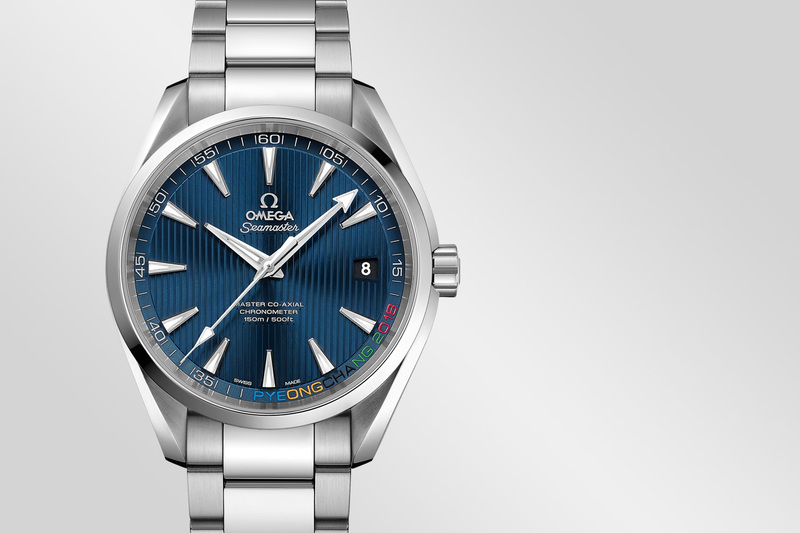 Omega are known for their sports watches, for the Speedmaster, for their precise and now anti-magnetic movements, but not so much for using traditional complications in their watches. 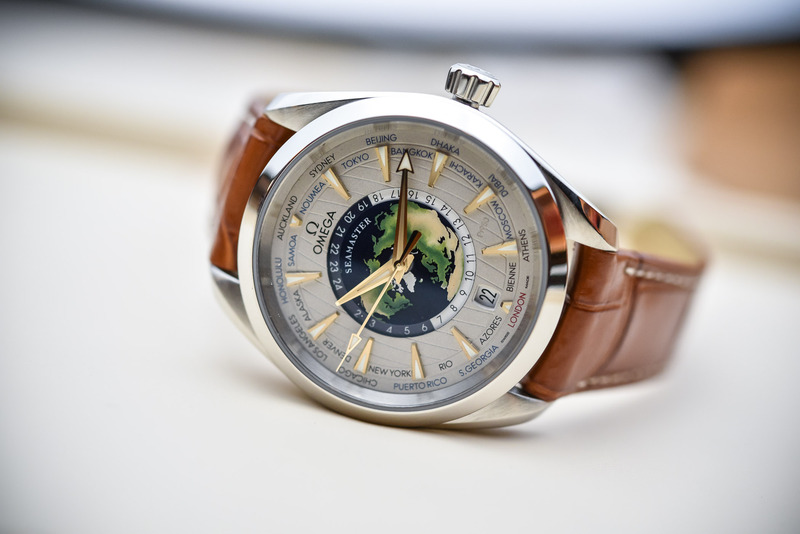 Thus, the watch that we are presenting today, the Omega Seamaster Aqua Terra Worldtimer, is quite a surprise. Don’t get us wrong though… It’s not because Omega can’t specialize in complications that they actually don’t do it. In fact, achieving to industrialize a movement that resists magnetic fields over 15,000-gauss and with superior chronometric precision certainly is much more demanding than creating a display of the 24 main time-zones around the world. A World-Time display is, after all, a well-known complication… So there no doubt that Omega can – and did – create such a watch. 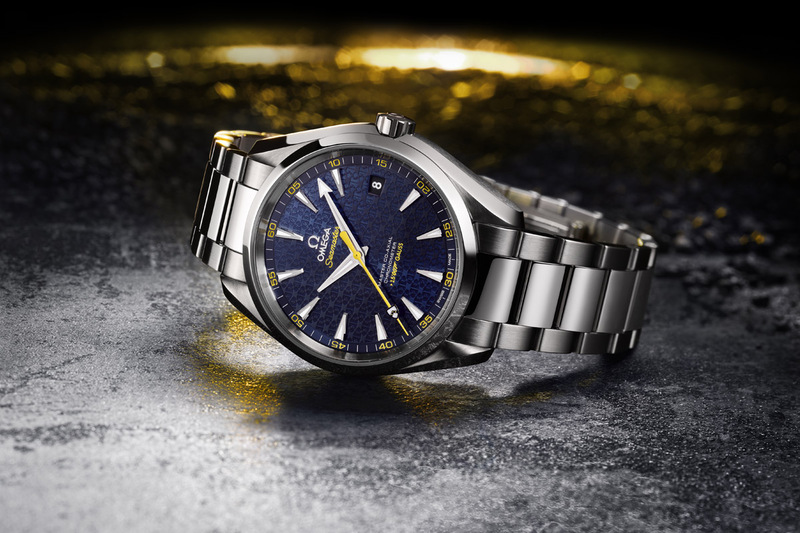 And to mark the arrival of this new model, with its brand new movement (or at least the module on top), Omega will first launch an ultra-luxurious limited edition, in only 87 pieces, with solid platinum all around – certainly before this Seamaster Aqua Terra Worldtimer evolves to gold and maybe steel versions. 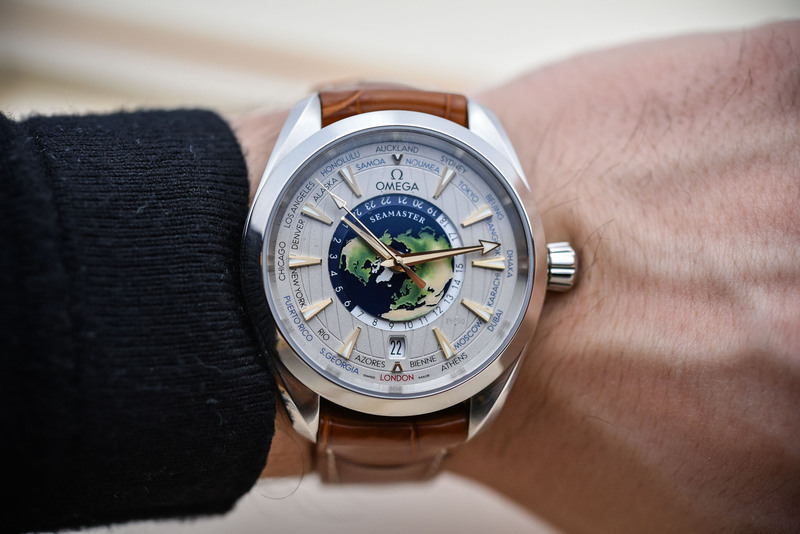 For this Seamaster Aqua Terra Worldtimer, Omega uses the classical case that made the collection successful since 2002: a sleek design, combining a symmetrical shape, a polished and flat bezel and the signature twisted lugs (that collectors have named lyre lugs). This case might be simple but it remains extremely easy to identify as Omega. 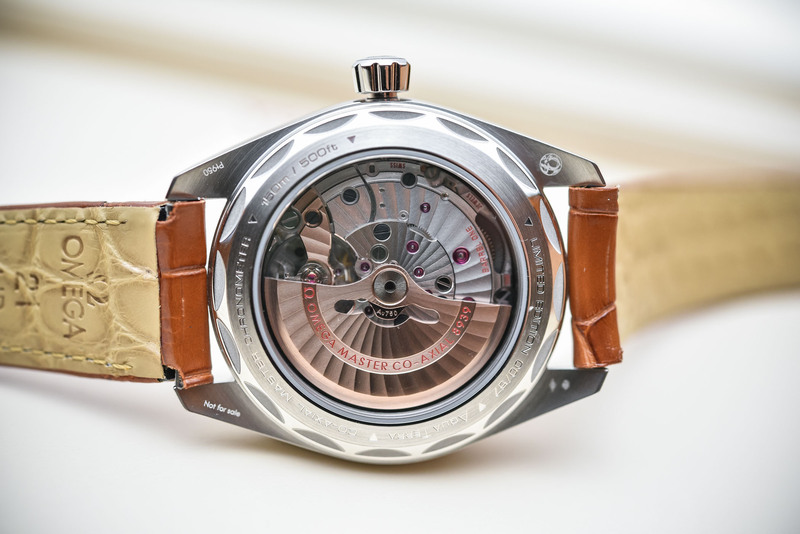 It is presented here in a quite large 43mm diameter case and crafted in 950 platinum. Due to this large diameter/platinum combination, the watch is on the heavy side but thankfully comes on a leather strap, with a platinum folding buckle balancing the weight all around the wrist. Note that the crown is in the vein of the 2017 standard collection, with a new conical shape and, usual for this collection, the case is water resistant to 150m. 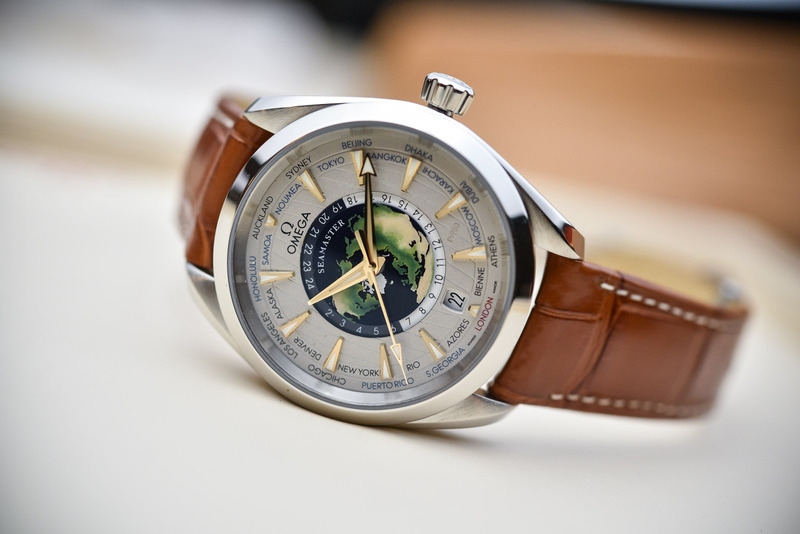 The main attraction on this Omega Seamaster Aqua Terra Worldtimer is, of course, its display – it is indeed Omega’s first ever Worldtimer. 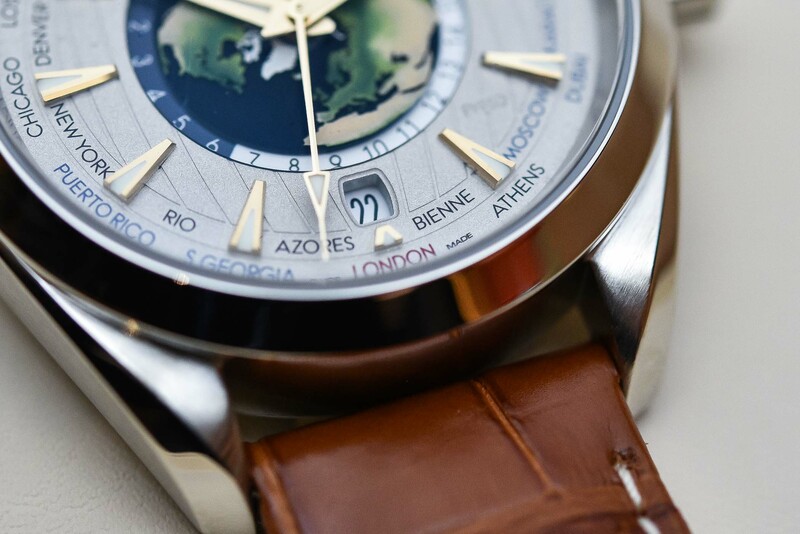 The Worldtimer is a classical complication that allows having all 24 main time-zones around the world displayed at once on a dial. It is composed of usually 3 elements: a city ring on the periphery (which shows 24 large cities), a central world map (to have a geographical representation of the time zones around the world) and finally a 24-hour disc that rotates over the day, and pointing the actual time it is in the 24 cities displayed. 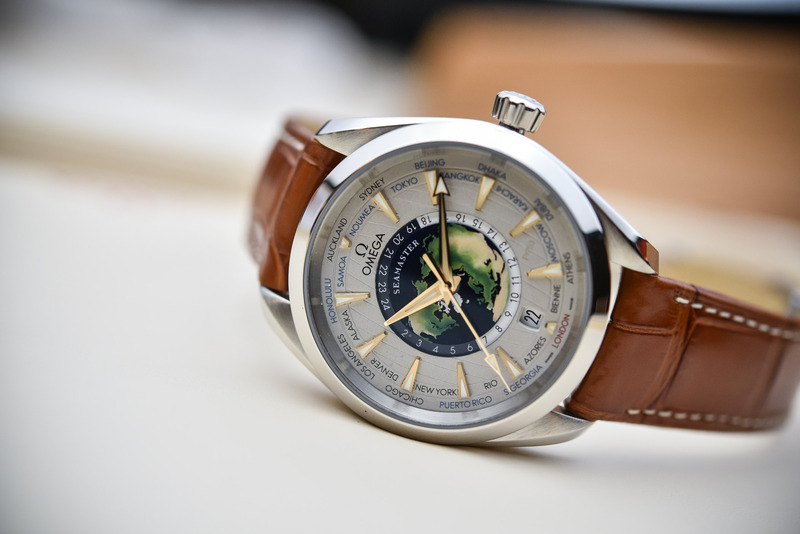 The Seamaster Aqua Terra Worldtimer combines all of these features. The outer-ring of the dial is made from solid, sandblasted platinum (see the small engraving “Pt950” between the 4 and 5 markers), with horizontal lines that recall the classical teak pattern of the Aqua Terra collection. Indexes and hands are done in 18k yellow gold, both coated with white luminous paint. The indexes have a deeper and sharper profile than on the standard Aqua Terra watches, yet their style is consistent with the rest of the collection. Hands and indexes are facetted, with polished sides and brushed flat surfaces. A date window sits at 6, slightly recessed as it is under the Worldtimer module. The city ring depicts main global destinations, which are printed in red (GMT), black (+1h in summer) or blue (places without daylight savings). 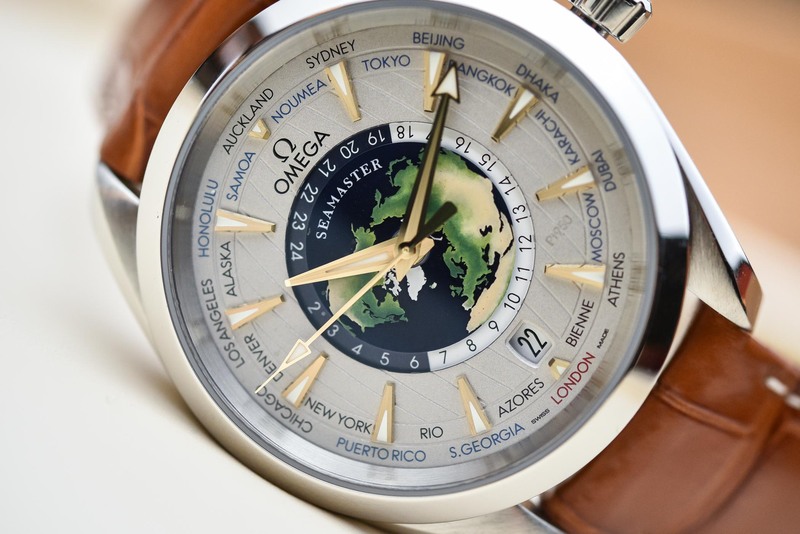 A small detail to note is the GMT+1 city, which usually reads Paris but here Omega chose to print Bienne (French for Biel, where Omega’s headquarters are located). The 24-hour ring is classical, with day-time on a white back ground and night-time on a dark blue background. 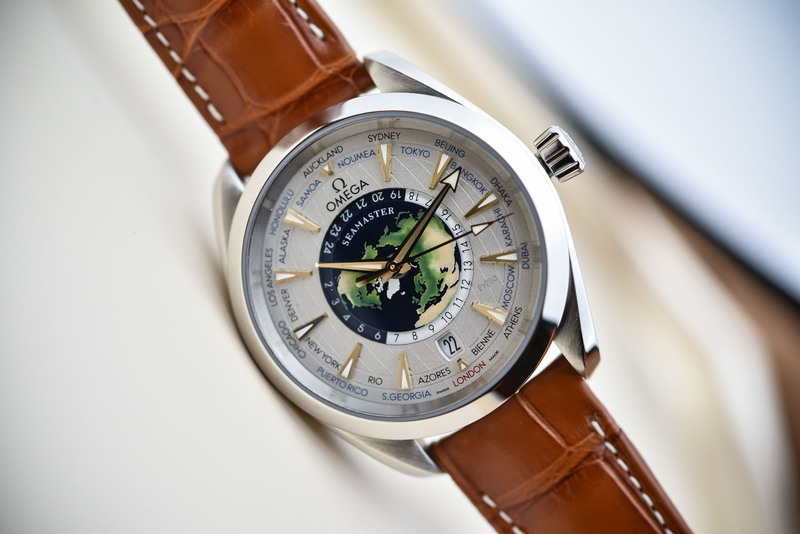 The central world map on this Omega Seamaster Aqua Terra Worldtimer is also quite special. It is made with a sapphire crystal disc, upon which the map has been hand-crafted in enamel. The entire display is controlled by the crown (no pushers or recessed buttons in the caseband) and is powered by the calibre 8939. Based on the 89xx series, this movement shares the twin-barrel for a longer power reserve (60 hours) and a more stable delivery of the torque. The co-axial escapement is, of course, part of the package. It is a Master Chronometer movement, meaning that it’s chronometer certified by METAS and offers a massive resistance to magnetic fields. The decoration is classical for the brand, with arabesque Geneva stripes, and gold rotor and balance bridge (as on many Omega watches in precious metal). 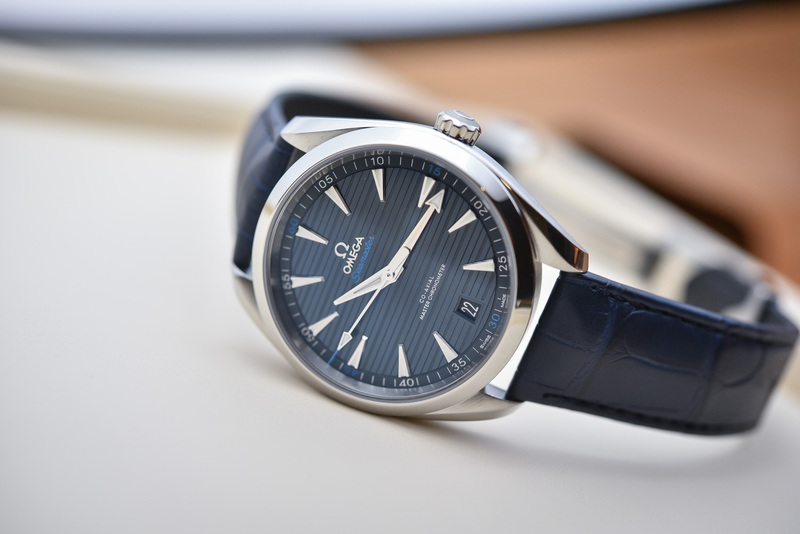 The Omega Seamaster Aqua Terra Worldtimer Limited Edition In Platinum (ref. 220.93.43.22.99.001) will be available at Omega boutiques and retailers in December 2017, priced at US$48,600 and only 87 pieces in this configuration will be done. Consider it as a collector’s piece or a commemorative watch, before Omega surely will introduce more accessible versions. 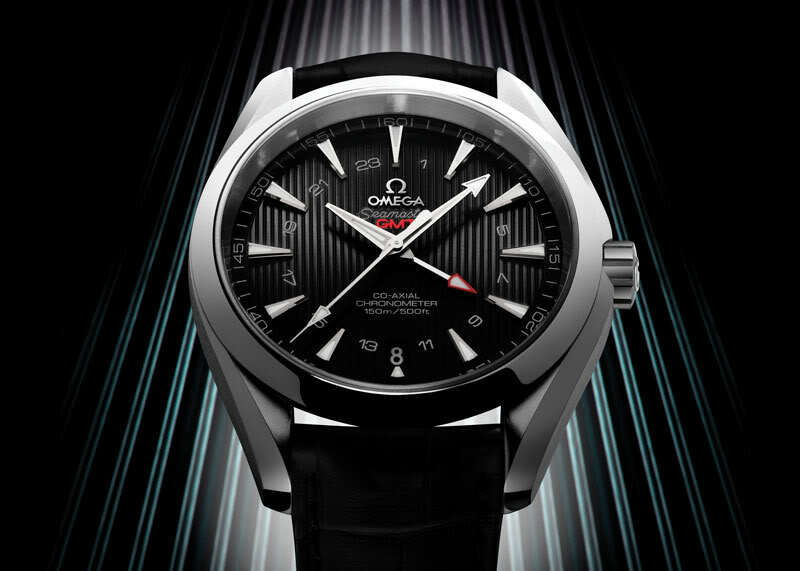 More details on omegawatches.com. Have always liked Omega watches, whether vintage or modern. 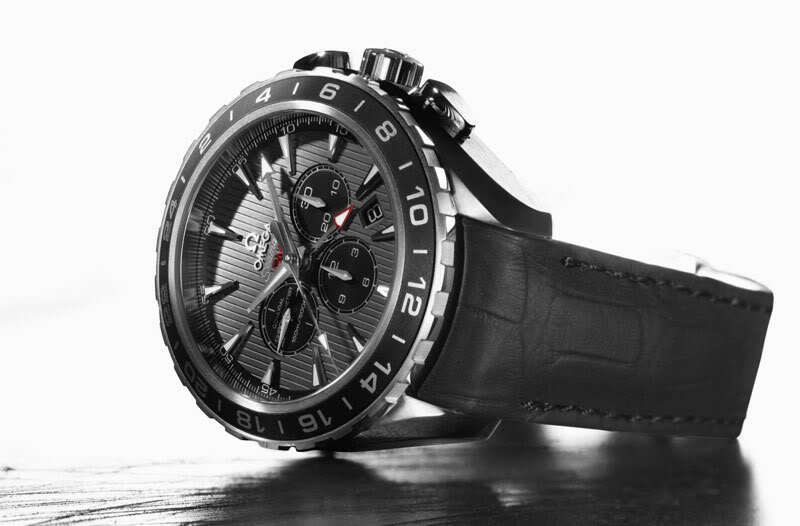 Perhaps this watch puts Omega on to yet another new path. Are there any more affordable World Timer models in the horizon? Overall good looking watch but not a great design as a world timer. By placing he 24-hr ring in the center instead of right next the cities, It’s much harder to read the world time, especially only with a quick glance. VC and PP’s world timers still rule with no close competition (regardless of using PM or SS).